Discover Salento by car, by boat or from a helicopter! Trekking, hiking and urban trekking are amazing opportunities to explore the beauty and the nature of this land. Local guides will be happy to accompany you. Contact us for further information. you’ll also find a guide to come of the most beautiful beaches in Puglia below. Mini cruises, grotto tours and coast trips are among the best ways to really enjoy the Salento seaside. 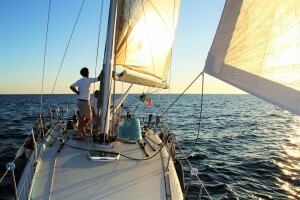 You can hire a boat either on your own or with a skipper for your personal adventure on the Salento ocean. Buffalo mozzarella making. Due to the characteristics of the buffalo milk, the dough has to be worked early in the morning at 8am. Primosale making (soft and delicate cheese) either at 10 am or at 11 am. You may also visit the buffalo farm and the small zoo as well as taking a walk through the herb path or to the Byzantine crypt (1000 AD). The name Cutura comes from “Li cuti” which means rocks, in fact in this area the ground is full of rocks and stones. La Cutura was an eighteenth century farmhouse where there were various stables and outhouses. It was recently transformed into a botanical garden, which has the best collection of cacti in the whole of Italy. There are two thousand specimens in the collection. Your villa is close to many beautiful beaches many of which are blue flag. Here is a brief guide to the best. Alimini Lakes: two oval-shaped expanses of water called “Big Alimini” and “Little Alimini” (or Fontanelle) parallel to the coast. Baia dei Turchi (Turkish Bay) beach is dazzlingly beautiful, wild and untouched. It can only be reached on foot. The perfect location for summer vacations for those who love spear fishing and swimming in clear water, surrounded by scenery that’s different from the usual beaches, full of rocks and caves. A beautiful seaside resort. Ideal place to feel the intensity of the sea, enjoy the beauty of the coast, rich with grottos, and swim in deep crystalline waters. It is known for the unique and stunning Zinzulusa cave. One of the most popular places on the Ionian coast, it is also known as the “Ionian pearl”. The coastline is formed by a series of long sandy beaches A few km up the coast is Rivabella, with Caribbean-esque sandy beaches. From this point on, small stretches of low-lying rocky coastline alternate with long, sensuous expanses of sandy beach. Also of great interest is the lagoon-like, sandy sea-front of Porto Cesareo, delimited by its own promontory and the offshore Isola dei Conigli, and the 20 kilometres of continuous beach along the south-facing stretch of coast. he magnificently sea-sculpted chalky-white cliffs, transparent waters and sandy beaches of Torre dell’Orso are not to be missed. Right after it there is an area rich in sandy shores, inlets and with a thick maquis. Here the Adriatic and the Ionian seas meet. the coastline is characterized by rocky cliffs, probing inlets: about 6 km running along Marina di Salve, through Marina di Pescoluse and up to Torre Pali. A brief interruption of rocky coastline soon gives way to more spectacular sand and turquoise waters. 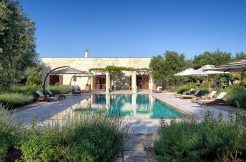 Not far from Otranto, it is punctuated with dry-stone walls and dipped in oleanders and prickly pears. Sea is a dark blue expanse only broken by its white indented coastline. Flat beaches with fine white sand and blue clean water situated in a natural environment consisting in white dunes. It is called “The Maldives “of Salento. This natural park is one of the most amazing in Italy. The park is a lush forest of pines and macchia Mediterranea, along one of the cleanest shorelines of Italy.